When a beekeeper wants to expand the number of hives they manage, there are many different options. The more pricey routes include buying package bees or established colonies from other beekeepers that can run anywhere from $100-$200 per colony. The more cost effective routes include catching swarms, doing a cutout of a feral colony, or splitting existing hives. Of all these, the most common and efficient is making splits from existing colonies. We tend to do spring bee hive splitting. Honeybees naturally reproduce colonies through a process called swarming. A typical swarm is when a colony of bees make new queen cells within the hive. Then right before the first new queen emerges, the old queen will leave the hive, taking half of the colony with her. They will cluster on a branch while scout bees look for a good place to establish a new colony. Shortly after the old queen leaves, a new queen will emerge in the old hive, and inherit the job of populating the original colony. Swarming typically takes place when a colony is strong and their numbers are outgrowing their hive space. When beekeepers split hives, they are manipulating the bees to start a new colony. Splits are made both to control swarming and to expand hives. There are many different methods to making splits and none of them are necessarily right or wrong. A beekeeper can simply split a box of bees in two, whichever one doesn’t have the queen will raise a new queen as long as they have young larva in the box. 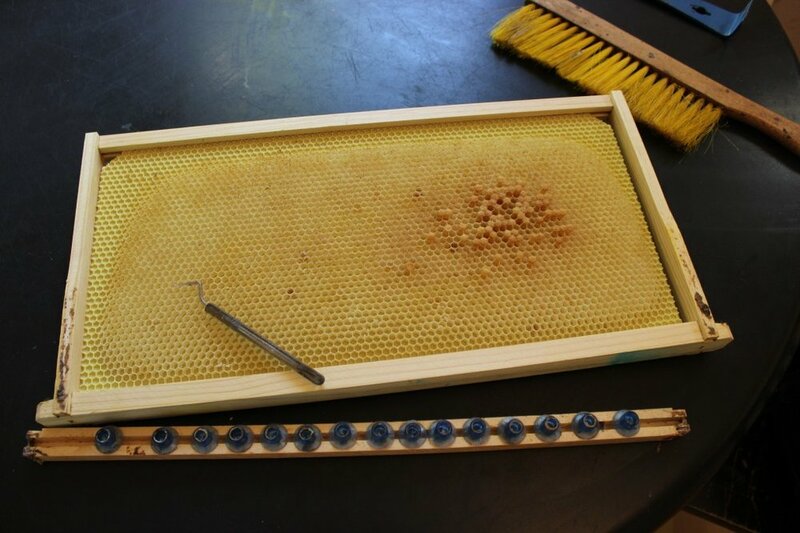 Another method is to place a purchased queen or queen cell in the split so that the colony doesn’t have to wait about three weeks while they are raising a new queen. This is done by taking the queen, three frames of brood, two frames of pollen and honey, then putting them into a nucleus box, which is a half size hive body, and moving them to a different location. The first queen to emerge in each hive will immediately begin chewing out the sides of the other queen cells in order to kill the other queens before they emerge. There can only be one queen per colony. She will then go on mating flights for a few days and a week or so later begin laying eggs if all goes well. Later in the Spring when we have a lot of hives to split at once we will graft queen cells in order to get a bunch of queens ready at the same time to put into the new splits. Grafting queens is an interesting process that we will share more about in the future.